Four months after being officially announced, the Archos GamePad is now available for purchase in some markets across Europe. Priced at 150 Euro (about $194), it is a rather unusual Android tablet marketed at gamers. The device offers physical gaming controls – a 4-way directional pad, a set of action buttons, and dual analog sticks, all the while being a fully functional Android device with access to Google apps and the Play store. What completes the package is the key mapping tool provided by Archos, which allows even games that are not optimized for the GamePad to work with its hardware buttons. 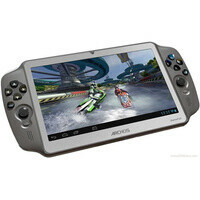 As far as hardware specs go, the Archos GamePad offers a 7-inch capacitive touchscreen with resolution of 1024 by 600 pixels. It is powered by a dual-core Cortex-A9 processor clocked at 1.6GHz backed up by a quad-core Mali 400 GPU and 1GB of RAM. You also get a front-facing camera, built-in speaker and microphone, 8GB of storage, and a slot for microSD cards. Wi-Fi connectivity is on board, but GPS is a no-go, according to the product's specs sheet. Android 4.1 Jelly Bean comes pre-loaded. The Archos GamePad is 10 millimeters thick and weighs 330 grams. The Archos GamePad is scheduled to arrive in the U.S. early next year, presumably at a similar price. Haha still, this tablet has Vita written all over it. no not really!!! the new nintendo wii U gamepad dont look like that! if it only had an option to pop out the tablet(the white part) from the joy pad(the grey part), this wouldve made a good hybrid. One question!! How on earth are we supposed to play with it since it's 7 inch! Of course, the game-play will be amazing because of the screen, however, i don't think this will be easy on the hands. I'm just being skeptical... PA, i hope you review this. I actually like it and the specs are not that bad. I also would like to see PA reviewing it! Only worry I would have is battery life with the high frequency of the CPU and the most likely 45nm technology of the chip. I've read from 2 different sources that it is either a 40 nm or a 32'm. However I trust the sour that said 32 nm more. It shouldn't be that bad. However battery life is still bad. The GPU is a quad core. The processor is an rk3066 which is paired with a mali-400mp4.